With 226 IHRA season champions onsite, the Summit SuperSeries was the largest gathering of track champions in drag racing history. Hundreds of drivers representing 27 states and four Canadian provinces gathered at Memphis International Raceway to compete in the Oct. 21-22 Summit World Finals. The Summit SuperSeries, a competition among bracket racers representing all IHRA divisions, crowned three World Champions: Mickey Nelson (Top (Box)), Vic Ellinger (Modified (No Box)) and Allison Lloyd(Junior Dragster). Nelson and his father, Mickey Nelson, had a problem, but it was a good problem to have. With the younger Nelson’s victory in the Summit SuperSeries Top Class, the Nelson family had to get the car that won the title in the truck along with their brand new Custom-built American Race Cars Dragster that came along with a host of prizes for winning one of the most prestigious sportsman races in the world. The new dragster features Trick Flow Specialties 572 Big Block Chevy engine and custom paint from Imagine That Customs. Nelson, who defeated Tony Lafever in the finals, also won $10,000 from Summit Racing Equipment, a seven-night vacation for two on the island of Aruba, a World Championship diamond ring, and of course, a world championship Ironman Trophy. Ellinger defeated Bobby Paul Arnett to claim the Mod World Championship; the Mod champ also took home an impressive haul of prizes. In addition to his World Championship Ironman Trophy and diamond ring, Ellinger won a 28-foot enclosed Performax trailer, $10,000 from Summit Racing Equipment, a $2,500 Trick Flow Specialties gift certificate, a two-post Gemini Auto Lift, a seven-night vacation for two on the island of Aruba and a Jones Transmission cooling system. “It was a nail biter,” Ellinger said in the winner’s circle. “Honestly, that finish line was a blur. I always try to have a little snap shot of what it looked like at the finish line, and it didn’t look like eight thou to me, but it worked in my favor so I’m more than thankful. I don’t know how this feels yet – I’m afraid to go back to my phone. I’m sure it’s dead from all the messages, but seriously, it’s a dream. I’ve raced 26 years since I was 14 years old, and we didn’t have Junior when I started at Norwalk Raceway Park, my home track. I’ve been trying to win the bracket finals for 26 years, and I thought was enough. Then I said, ‘I have to go Memphis – all I can do is try and treat it like Jerry Pennington’s World Footbrake Challenge because it’s the best of the best every summer.’ One year I won a Sunday race there and felt that was the best I could do for my career, but here we are – I’m a World Champion; it’s pretty amazing. The final round in Summit SuperSeries Junior Dragster was an all-female affair with Lloyd taking the title over Emily Million. With the World Championship, the 17-year-old driver won a Custom-built JR Race Car Junior Dragster featuring Custom Paint from Imagine That Customs, $3,000 from Summit Racing Equipment as well as the World Championship Ironman Trophy and diamond ring. The $240,000 program is the championship competition for IHRA member track sportsman racers. 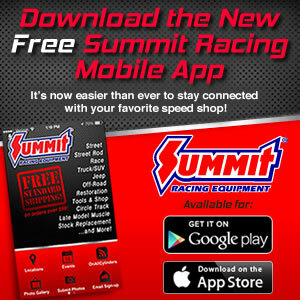 To qualify for the season finale, drivers either won their Summit SuperSeries track championship or the Summit Team Finals main event for their division. Aruba Vacation for Two: Seven night/eight-day trip for two people; includes airfare, car rental, island tour, hotel and dinner/lunch packages courtesy of AroundAruba.com, El Gaucho Restaurant, Tropicana Resorts, More 4 Less car rentals and the crew of Don Flip Racing Team.